The AKG PW45-PRES Perception wireless microphone systems is a premium wireless audio solution for presenters and public addressing applications. The AKG PW45-Sport Perception wireless microphone systems is a premium wireless audio solution for instructors, performers and public addressing applications. 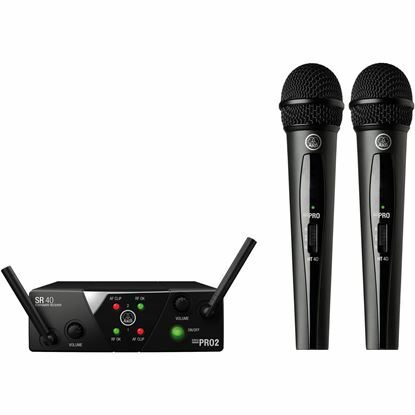 The AKG PW45-Vocal Perception wireless microphone systems is a premium wireless audio solution for on stage and live vocal applications. The WMS40 Mini Dual Vocal Set is a true plug 'n’play wireless solution. Compact and ready to go instrument wireless microphone system. Compact and ready to go vocal wireless microphone system.